i Still write: KA, KA, KA.. Hairball!! I just received my order from Catslife Press. 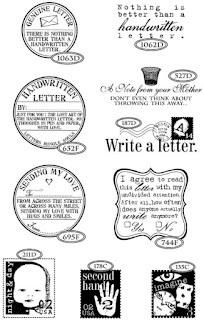 Rubber Stamp producers extraordinaire. Noo, really I love their stuff. Here is some of the stamps I have procured for your enjoyment. OK, not the ones at the bottom cause they kind of freak me out. Especially the baby face. (shiver). And not the a Note from your mother. Cause I'm not one (that's not nice to talk about me that way) and that would be just wrong. Now "some" of you that have been reading this blog for awhile (I KNOW YOUR OUT THERE.. I CAN HEAR YOU BREATHING!) saw the post on envelope and embellishments. I mentioned I would be giving one of these stamps away. I "will" be, I have received another of the snail mail stamps for that purpose. I need to figure out something cool for this one and frankly I have 2 giveaways going on right now I need to get finished up with first. This is one prize that is definitively mail related and usable by everyone (stamp pad not included). Need to think snail related, slug like, hmm something will come to me. Anyway be looking for this one coming to a theater near you. Will think of something neat to pair with it. Escargot?? I have plenty of stamp pads inked and ready! I'm glad you didn't get those three at the bottom, they are a little creepy. And yes, the baby face would freak me out as well! This "caragol" ('snail', in my language) is just perfect! The baby face is little bit creepy for me also. Thanks for the link. 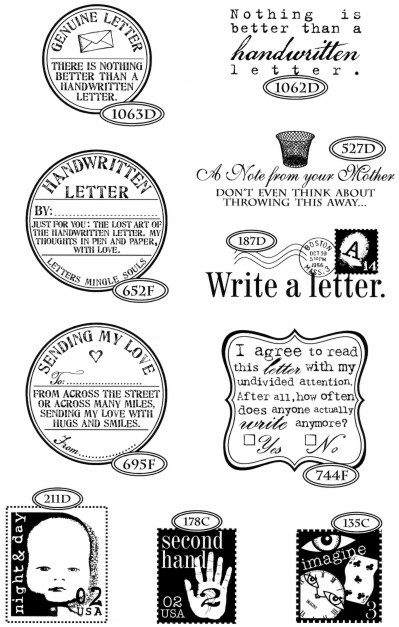 I will check the link out in few days....it is never enough to have more rubber stamps to my collection. I am glad I came upon your blog. When your loved one is taken down.. When the kids start writing..